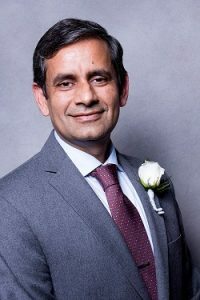 Dr. Indrajeet Chaubey is a Professor and Head of the Department of Earth, Atmospheric, and Planetary Science and Professor of Agricultural and Biological Engineering at Purdue University. Dr. Chaubey obtained his M.S. degree from the Department of Biological and Agricultural Engineering (BAEG), University of Arkansas (1994) and Ph.D. from Oklahoma State University (1997). He served as a faculty member in the BAEG department from 2000 to 2006 during which he established a nationally recognized research and teaching program in the field of nonpoint source pollution, hydrology, and watershed management. He co-led the development of Eucha-Spavinaw Phosphorus Index that was used by the federal court to lift moratorium on poultry litter applications. He was chair of the BAEG Graduate Committee and led revision of the department’s graduate program. During his leadership, the number of graduate students in the department had quadrupled. Dr. Chaubey’s teaching and research activities include ecohydrology and water quality with emphasis on watershed scale terrestrial and aquatic water quality processes. He has developed decision support tools using watershed models to evaluate impacts of watershed management strategies on water availability, water quality, crop production, and ecosystem sustainability. Dr. Chaubey has published more than 390 research articles, including 100 peer-reviewed journal articles and more than 190 technical papers in various conferences, and has given 49 invited presentations at various regional, national, and international conferences. Dr. Chaubey has directed research work of 30 M.S./Ph.D. students. He has served as a lead/co-lead investigator on projects funded by U.S. Environmental Protection Agency, U.S. Department of Agriculture (USDA), National Science Foundation, and U.S. Department of Energy (DOE) totaling more than $15 million. He has won prestigious honors/awards including Arkansas Section of ASABE Outstanding Engineer Award (2006), Gamma Sigma Delta Faculty Research Award of Merit (2006), New Holland Young Researcher Award (2007), University Faculty Scholar (2011), Purdue University Agricultural Research Award (2012), and ADS/Hancor Soil and Water Engineering Award (2014).